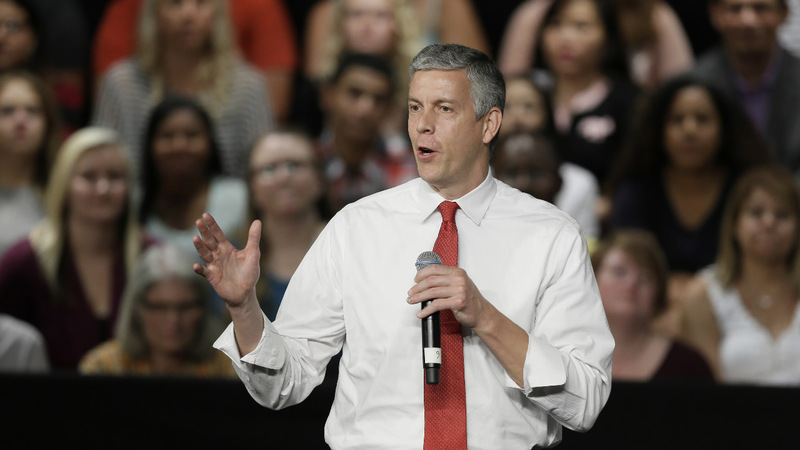 CHICAGO -- Education Secretary Arne Duncan is stepping down in December after 7 years in the Obama administration. Duncan says in a letter to staff that he's returning to Chicago to live with his family. The letter was obtained by The Associated Press and confirmed by a White House official. The official wasn't authorized to comment by name and spoke on condition of anonymity. President Barack Obama is tapping Education Department official John King Jr. as acting secretary through the end of his term. But Obama is not nominating King to be secretary. King is currently serving as delegated deputy secretary. He oversees preschool through high school education and manages the department's operations. Obama plans to discuss the change in leadership Friday afternoon at the White House.